Called injogogi in Korean, “man-made meat,” is a popular street food in North Korea. The food comes from taking leftovers from making soy bean oil, pressing it and rolling it into a paste. The result is then filled with rice, and topped with chili sauce. Injogogi is traded in North Korea with other goods and services on informal markets, known as jangmadang. Defectors from North Korea say there are hundreds of these markets. They are part of the country’s “barter economy.” This informal market system has helped people survive through years of sanctions and separation from the rest of the world. After World War II, North Korea was established with support from the Soviet Union as a socialist country. The collapse of the Soviet Union in 1991 severely hurt the North Korean economy. It also led to the breakdown of the centralized food distribution system. It is estimated that as many as three million people died in the following years. People were forced to negotiate for food any way they could. People line up to eat at a food kiosk in Pyongyang, North Korea. Since then, studies have found that person-to-person dealings have become a way for millions of North Koreans to find basic needs such as food and clothing. The popularity of informal markets, however, also makes it difficult to know what is going on in the North Korean economy. The informal markets also make it harder to measure how sanctions are affecting the North Korean people. The U.N.’s World Food Program, or WFP, says the Public Distribution System for food was brought back in 2006. The North Korean government says 70 percent of North Koreans still use the state’s system as their main source of food. This is the same percentage of people that the U.N. estimates are “food insecure.” The WFP says the system regularly provides lower food rations than the government’s daily target. The WFP and the U.N.’s other main food aid agency, the Food and Agricultural Organization, said the U.N. uses all available information, including official statistics. The agencies have an office in Pyongyang and make regular visits to North Korean Public Distribution Centers, farms and occasionally markets. The agencies said that the biggest concern is the lack of different foods. The statement says main foods include rice, maize, kimchi and bean paste. These lack important fats and protein. Last year, North Korea’s economy grew by 3.9 percent – its biggest increase in 17 years. The increased activity came from mining, market reforms and business with its neighbor China. Reporters saw signs of hunger in North Korea as recently as 2013. The WFP says one in four children do not grow as tall as children in South Korea. However, defectors say the food supply has improved in recent years. Eight defectors told Reuters they ate similar things to South Koreans. They said most families had privately grown vegetables, locally made snacks, rice, and corn in their homes. 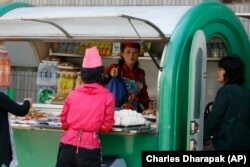 A vendor sells food and drinks out of a kiosk in Pyongyang, North Korea. Younger and wealthier defectors say they had meat, such as pork, dog, rabbit or badger. However, they said the meat supply was seasonal because electric power is not dependable enough to power refrigerators. Defectors also say that North Korean president Kim Jong Un has quietly relaxed the rules on private trade. Some markets in North Korea are known as “grasshopper markets” for the speed that traders set them up and take them down. Many are illegal, but there are also officially approved markets. Food such as injogogi are popular at these markets. It is low in calories but has protein and fiber, said Lee Ae-ran, a chef from the North Korean town of Hyesan. The website Daily NK, which is based in Seoul, South Korea, reports on jangmadang markets. It is operated by North Korean defector journalists. In a report released in August, it said there are 287 official markets in North Korea, including more than half a million stalls. Over 5 million people are either “directly or indirectly” depending on these markets for food. This means the markets are necessary for people’s survival, the report said. In 2015, a survey of 1,017 defectors by Seoul University professor Byung-yeon Kim found that official food sources only make up 23.5 percent of North Korean’s food. Around 61 percent of people asked said private markets were their most important source of food. Fifteen-point-five percent said they rely on self-grown food. 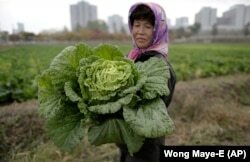 A farmer carries a fully grown cabbage after plucking it out from the main crop which will be harvested early next month, and used to make Kimchi. However, wealthy people in North Korea have more choice. In the capital, people can order a pizza in one of Pyongyang’s hundreds of restaurants, visitors say. Many of the restaurants are owned by the state. Some used to be only for tourists, but now they have local customers, who sometimes pay in euros or dollars. There are also other ways North Koreans can support their diets. “My dad often received bribes,” said one 28-year-old defector. She said he was a high-ranking public official, and the bribes he received included goat meat, dog meat and deer meat, she said. This story was originally written for Reuters by James Pearson and Seung-Woo Yeom. Phil Dierking adapted the story for VOA Learning English using other media. Mario Ritter was the editor. How do people get their food in your country? We want to hear from you. Write to us in the Comments Section or on our Facebook page.